Candlelight creates such a warm relaxing feeling and it can really set the tone for weddings, receptions, celebrations or even for an extraordinary night at home! 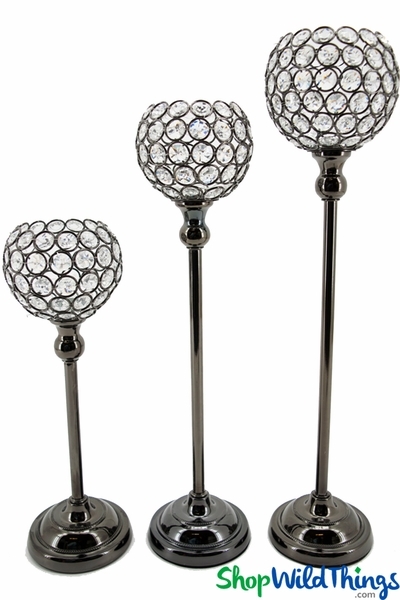 Used as centerpieces for your special event, this Set of 3 Prestige Real Crystal Beaded Candle Holders will create a truly unforgettable evening! The awesome shade of this candle holder set is a luxurious shade of charcoal gray. The finish is so smooth, shiny and rich that it looks like liquid gunmetal and we're equally proud of our sparkling, GENUINE crystal beads which are exceptionally clear and the faceted sides glisten with even the slightest bit of light! Our crystal beads are real crystal, not acrylic and they are faceted on all sides. You will find sellers who "sneak" in plastic beads or mix acrylic with glass beads. We are fanatical that this is NOT done on our products. 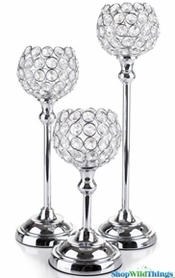 The height of the candle holders is 13 1/4", 17 1/4" and 19 1/4" tall while the goblets are 4 1/4" wide by 4" deep. The candle plate is 1 1/2" in diameter and we popped in 1 LED submersible light and could hardly believe how astounding one little light looked in this holder! We tried a purple light then a teal light and because of the bead clarity against the dark finish, these charcoal gray candle holders seem to make the beads glow even brighter! Of course, an LED flickering flameless candle always looks awesome. 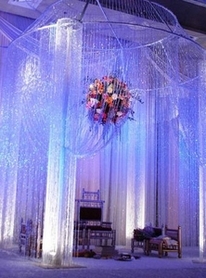 In addition to a light source you could also sprinkle in some diamond confetti, silk rose petals or place a pomander kissing ball on top. Please view the short video below to see why we're so proud of our Prestige products!